The upgraded Huawei Watch 2 added features like eSim into the mix, yet it also left the door open for something more radical to become a proper new flagship. What could the big new smartwatch have in store for us? Is it the sporty Huawei Watch GT? Is it the rumoured Watch X? More importantly, when is it coming? Here's what we think we know about the next generation Wear smartwatch. Three Wear watches for the price of one? In July, trademarks listed with the World Intellectual Property Organization indicated that we might not just see one Huawei Watch 3 – we might see three. Each trademark sported a different name: Anchor, Voyage and Unlimited. Importantly, the filings don't exactly indicate what device this is. Since then, we've also learned the names of two different watches on the way. An FCC filing revealed the Watch GT, which boasts a 1.4-inch AMOLED display with a resolution of 454 x 454. It's a chunky beast with a 46.5mm case – Garmin Fenix territory – that results in 14 days of continuous battery life when GPS and Always On mode are turned off. There's also the Watch X, which was revealed by a filing with the European Union's Intellectual Property Office. There are much less details about this watch, other than the fact it's a smartwatch with a trendy Roman numeral added onto the name. Could it be that Anchor, Voyage and Unlimited were temporary monikers meant to get through some regulatory processes without raising suspicions? Are Watch X and Watch GT the real names of two of these devices? 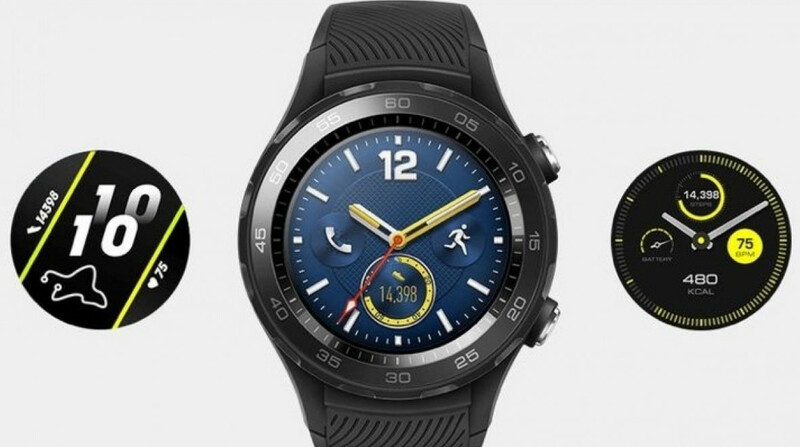 It's unclear, but we do know that Huawei has used multiple names in the past – like Classic and Sport – to differentiate between its smartwatch models. There's also no indication of what a third model might be called. Like the Galaxy Watch, it's possible the third model is just a variation of size. The Galaxy Watch has a 42mm model, a 46mm model and then a special edition rose gold 42mm model. It could be the same here. What could Huawei do to separate its new smartwatch from the rest of the pack? What about building a watch or a band that could carry your wireless Bluetooth headphones for you? That's something Huawei has been mulling, as the company has not one but two separate patents for a smartwatch that makes it easier to carry around those pesky Bluetooth headphones. The first method would see you slip your headphones into a little compartment where the band meets the watch. There's also a spring-loaded mechanism to keep them locked in place, so that they don't fly out of your smartwatch. The second method would see a little loop at the bottom of your strap, big enough for both headphones to slip right into. The idea of a smartwatch being able to hold onto your wireless headphones isn't too bad, actually. Smartwatches are increasingly aiming to be standalone devices, and Huawei has certainly tried before to pack as much technology as possible into its devices so that they could be standalone. When you're out and about and need somewhere to put them, your watch strap is as good a place as any. While it could be unlikely that this feature will make it into the Huawei Watch 3, just because of the patent only now being discovered – and patents being patents – it wouldn't be a surprise to see this down the road. Huawei has certainly done stranger things. When Huawei launched the Watch 2 Pro back in October in 2017 and then the refreshed Huawei Watch 2 2018 this year, both devices included eSim technology. This essentially meant you could get rid of a physical SIM card as it's built right into the device. It takes up no space and still lets you use LTE to make calls or use the internet. The great thing about an eSim is that it allows you to choose your carrier on the fly. For example, the LTE edition of the iPad comes with an eSim built in. You can head to the settings menu and simply choose your carrier. As the past two smartwatches that Huawei has released have featured eSim, it seems likely that the new watch will get the same treatment. This would be a decent upgrade over the Huawei Watch 2's nanoSIM technology. It would also allow the Huawei Watch 3 to save some space and slim down, which would be nice for a smartwatch that already packs several features. As for the rest of what the Huawei Watch 3 could have, you just have to look at the 2018 edition of the Watch 2 to get an idea of what you can expect. There's GPS, NFC payments, gyroscope, compass, barometer, heart rate, a geomagnetic sensor and a capacitance sensor, which could track humidity or sweating. The rumoured GT is also supposed to be swimproof, and there's even word Firstbeat, the company involved in creating Garmin's advanced biometric algorithms, is helping with a smart running coach. All of these would be powered by a new battery. CEO Richard Yu said Huawei was willing to wait until it could get a smartwatch working with a week-long battery. The rumoured GT is said to have a 410mAh battery that can be used for two weeks. That turns into seven days when Always On mode is turned on, and when GPS is turned on it drops down to just seven hours. Huawei has shown the ability to swing for the fences and really go for it with its other products, like its P20 Pro smartphone, and it has kind of done that with the Huawei Watch, cramming as many features as possible into its device. However, the Chinese company also needs to give us more when it comes to design. We quite miss the more luxurious look of the original Huawei Watch, which was dulled down a bit for the sequel. If Huawei can swing hard for a more classy look, or at least offer several different styles to suit different tastes, then it could well have a smash hit on its hands. Apple and Fitbit have both found additional success by making it as easy as possible for people to purchase a whole bunch of unique band options for their smartwatch. Huawei would be wise to adopt a similar strategy. It has the tech, now it just needs the panache. Huawei is in no rush to release the Huawei Watch 3. It didn't launch any wearables at Mobile World Congress this year, and it's been more than 18 months since the original Huawei Watch 2 launched. Instead, it launched a "Pro" edition of the Watch 2 last October and then a 2018 edition a couple months ago. So what's the deal – does Huawei not care about smartwatches? Well, it turns out that the Watch 2 is selling so well that the company is taking a more carefree attitude toward the release of the Watch 3. "It will come later – there's no hurry because Huawei Watch 2 sells well," said Huawei CEO Richard Yu in March 2018. "We're not in a hurry, so we're launching the new watch later." Whether we're now approaching "later" is the big question. According to a report from Wisebuy, the GT will launch for $275 toward the end of October, as Huawei plans to launch it alongside the new Huawei Mate 20 smartphone at that time.